The show is an emotionally-wrenching, life-affirming performance. 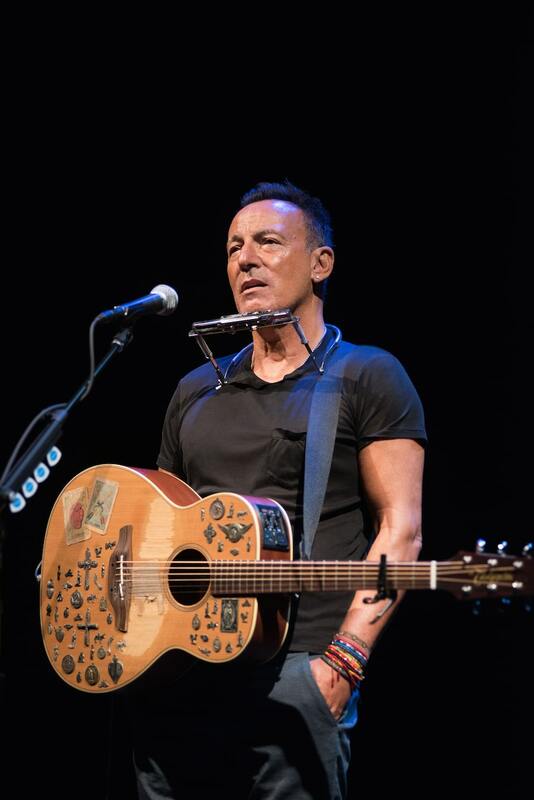 When Bruce Springsteen first takes the stage at the Walter Kerr Theatre for his latest endeavor — Springsteen on Broadway — he does not start strumming his guitar, or launch into song. Instead, he speaks. “DNA,” he announces, the very first word from the 68-year-old singer’s mouth, before launching into a monologue about the peculiar reality of earning a living as an ultra-famous rockstar. From that very first moment of the show, it’s abundantly clear that Springsteen’s new show, a scripted narrative performance of his life’s story, doesn’t quite resemble anything he’s ever done over his 45-year career. “I have never held an honest job in my entire life,” Springsteen tells the crowd early on. “Yet that is all I have ever written about.” Indeed, Springsteen relishes in a series of profound ironies throughout the two-plus hour performance, whether it’s the fact that the man who wrote “Racing in the Street” did not know how to drive until his mid-20’s, or that the singer best known for his anthems of small-town escape now lives just a mere ten minute drive from his hometown. Weaving spoken-word performances and dramatizations of lightly-edited passages from his 2016 memoir Born to Run with a 15-song overview of the singer’s life in music, Springsteen On Broadway is not an entirely new medium for the Jersey songwriter so much as a synthesis of many of the strains of his spoken-word artistry throughout his career as a storyteller. The roots of his latest show can be traced to Springsteen’s dramatic live song introductions from the 70’s, past eulogies to former bandmates, his cult-famous pair of intimate solo/acoustic 1990 benefit shows for the Christic Institute, and, most directly, a one-off, private farewell concert he performed for President Obama’s staff this past January. “The grinding hypnotic power of this ruined place and these people would never leave me,” Springsteen writes of his early-childhood home in his memoir. “I visit it in my dreams today, returning over and over, wanting to go back.” In the opening third of his show, Springsteen presents a carefully constructed, deeply affecting account of his childhood and upbringing, culminating in a suite of songs about his father and mother, respectively, with “My Father’s House” and “The Wish.” When speaking on stage, some of the easy-to-overlook anecdotes included in his memoir, such as his recounting of a dream he had about his father after his death, are delivered with a gut-punch sense of timing and gravitas. In the show’s middle third, Springsteen recontextualizes some of his well-worn classics: “Thunder Road,” introduced as a song about the thrill of fleeing home, is less a love story in which Mary reigns supreme than a world-weary, nostalgic ode to youthful escape the (“ghosts in the eyes of all the boys” Mary sent away are now “men”). “The Promised Land,” performed in a country/folk arrangement, is presented as a simple cross-country road trip travelogue. On the Broadway stage, Springsteen strips his classic songs of their rock and roll grandeur, presenting them instead as set-pieces. In the move from the arena to the theater, Springsteen’s anthems become anecdotes: after a lifetime of using spoken-word to enrich his music, the songs, for the first time, are subservient to the stories. In his Broadway show, Bruce Springsteen replaces the physical release of rock and roll spectacle with the stark simplicity of folk storytelling and dramatic narrative, and the result is an emotionally-wrenching, life-affirming performance, one of his most cunning magic tricks to date.